ROSE: My next guest is a legend in American television and has no peers in the craft of the on camera interview. 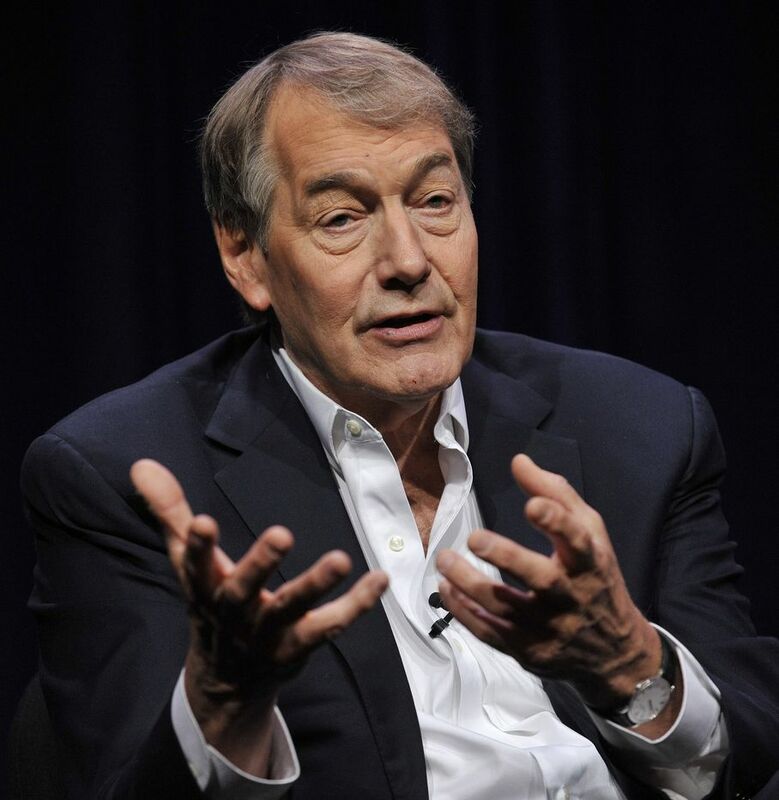 At 71, Charlie Rose is involved in four shows, with his flagship show airing five nights a week and hosting the “CBS This Morning“ five mornings a week. His ease at conversation, his top shelf guests, and consistent ability to make any topic intriguing is the envy of the entertainment industry. A seat at Charlie Rose’s table is the definition of success. In a Rose interview pretentiousness and ego whither in the glow of relaxed discussion that makes the audience believe he is best friends with the world. I’m pleased to have Charlie Rose at my table. Welcome. ROSE: You have a degree in Law? ROSE: But you have a law degree. ROSE: You were born and raised in Henderson, North Carolina. ROSE: And you have a house and a farm in North Carolina. (pause) What is it about North Carolina that attracts you? ROSE: Staying in touch with reality. I love the people and energy of New York, but North Carolina is part of me, part of my history. ROSE: Certainly, but for me is reminds me that what we see on the endless stream of news everyday is not what is happening in most of the world. I go there to keep the correct perspective. ROSE: Your parents had a tobacco farm and a store. And you helped out in the store. ROSE: Is that where you gained the ability to ….talk to people? ROSE: It contributed, I’m sure. In a small community there are always interesting people and they always had something interesting to say. ROSE: You were an only child….why didn’t you just stay in Henderson and stay with the family’s business? ROSE: I suppose it was not meant to be. Partly because I was good at basketball and partly because I wanted more…more knowledge. I had questions and I thought that college would give me answers. ROSE: No, but it did redirect me. ROSE: Law and politics. Both taught me that there is always more to any story. ROSE: You worked for Senator Everett Jordan. ROSE: Senator Jordan was a great statesman, also from North Carolina. ROSE: What was it about that experience that was so important in changing your degree from pre-med to law? ROSE: It might have been that I was just really bad at science…(both chuckle)…but Senator Jordan had just become the Chair of the Rules and Administration committee. He was the inside man on the inner workings of the Senate. Working for him I discovered what really drove the process of making new laws. ROSE: Morrow was from North Carolina, Brinkley was from North Carolina, Charles Kuralt…what is it about North Carolina the breeds great journalists? ROSE: There are a lot of great journalists from other places. I’m not sure North Carolina is any more special than any other place. ROSE: Okay, but North Carolina is not a place you’d expect to turn out internationally known journalists. ROSE: I think most good journalists are able to relate to people of diverse backgrounds. If you can get the farmer down the road to talk to you, then you probably talk to anyone. ROSE: How is it that you bring the best of the best to your table? You have people who will talk to you that won’t do interviews with anyone else…..How do you do that consistently? ROSE: You have great people. ROSE: Your ‘other’ Executive Producer, Yvette Vega? ROSE: Well, she’s at the top of the list. Yvette condenses my world into something manageable. There are guests that I recruit, but Yvette and the rest of the staff have a system of finding guests and then preparing myself and the guest or guests for the interview. ROSE: Your interviews seems spontaneous…are they? ROSE: That depends on your definition of spontaneous. I have a list of questions and discussion points. I also know about how much time we think we need to cover the topic. The staff finds out the what is relevant about the guest and topic and we have a game plan before I sit down with the guest. At the red light we finish the process with the interview. ROSE: Red light meaning the camera is rolling. ROSE: What’s your toughest interview? ROSE: People who are not used to the cameras, and people who hate doing interviews. ROSE: What is it about the lack of on camera experience? ROSE: I need a person’s total attention and inexperienced people tend to put a show on for the camera. They have a hard time ignoring everything else around us. ROSE: And people who hate interviews just don’t want to cooperate? ROSE: They spend too much time trying to avoid saying the wrong thing that they don’t say anything. ROSE: You worked with Bill Moyers. ROSE: In 1976 you won a Peabody Award for your interview with President Jimmy Carter….Was that the start of your career? ROSE: It was a significant milestone, but there were several things that happened that put me on the path of journalism prior to that interview. ROSE: What is it that you do in your interviews that makes the guests comfortable talking to you? ROSE: I’m not looking to generate a headline with my guests. ROSE: When I talk with someone I’m not looking to unveil any secrets. My guests know that we are working together to educate our audience on the topic under discussion. There is no hidden agenda. ROSE: Do you feel any pressure to entertain? ROSE: What’s more entertaining than learning something you didn’t know before? ROSE: Is there any retirement for Charlie Rose? ROSE: You just work until you die? ROSE: That would be perfect. People with a whole lot fewer windows to look at what makes the world go ’round than Charlie, write books or otherwise become “authorities”. Does Charlie feel like he could contribute, from what he’s learned, to solve some long-standing problems (i.e. by writing), or does he feel that he (and we) aren’t close enough to the “ultimate truths”, like how is matter, totally, constituted, or, the manner in which the human brain functions, etc., to presume to be able to make comprehensive predictions in historically complex fields? I don’t have an answer to your question. Personally, I admire that Charlie Rose attempts to bring the people to his table that can help the rest of us understand some of the significant issues of our time.